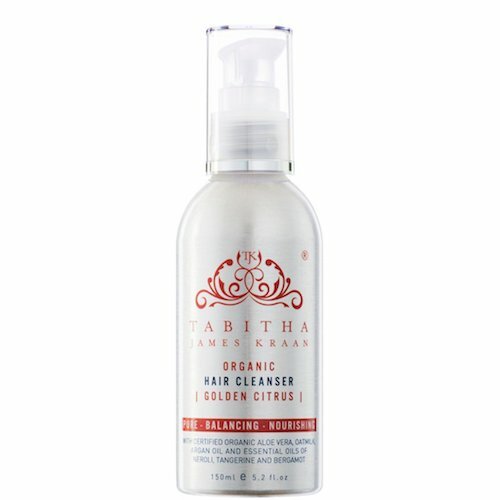 A departure from shampoo, the Balancing Organic Hair Cleanser by Tabitha James Kraan has revolutionized hair cleansing. 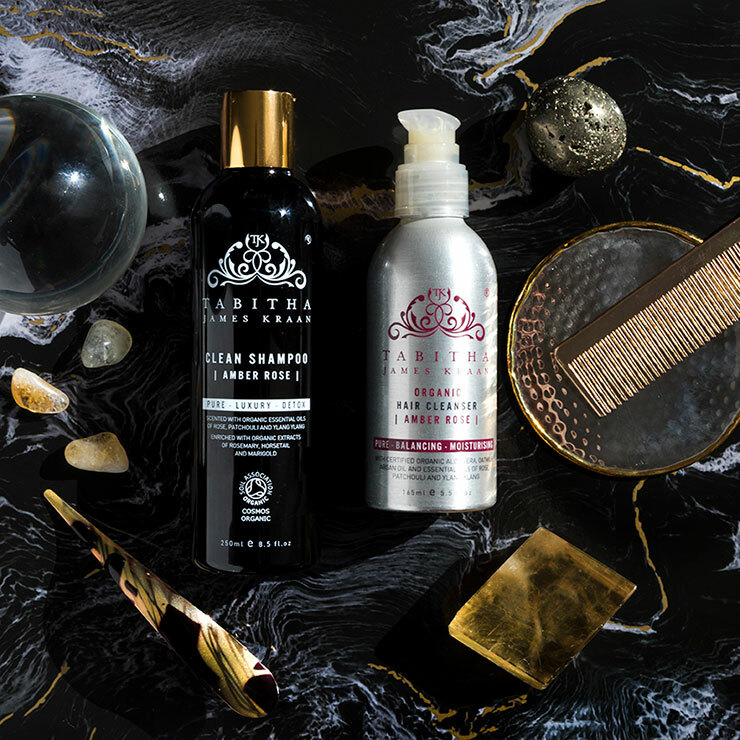 Your hair and scalp will feel naturally balanced, with diminished signs of over-oil producing or dry, flaky scalp. Absolutely no chemical detergents are used in this innovative hair care formula that cleanses using only natural soap bark, organic oats, aloe vera and essential oils, taking clean to whole new level. Apply 5 to 15 pumps of hair cleanser only to the roots of the hair and massage in thoroughly. Allow cleanser to penetrate 1-2 minutes while massaging only into the roots of the hair. Rinse thoroughly and follow with 4-in-1 conditioner. Golden Citrus: Avena Sativa (Aqua & Oat Kernel)*, Decyl Glucoside, Sodium Cocoamphoacetate, Coco Glucoside, Aloe Barbadensis*, Glycerine (Vegetable), Glyceryl Stearate, Xanthan Gum, Argania Spinosa (Argan Oil)*, Rosa Canina (Rosehip Oil)*, Cocos Nucifera (Coconut Oil)*, Quillaja Saponaria (Soap Bark)*, Benzoin Oil*, Dehydroacetic Acid, Sorbus Aucuparia (Sorbic Acid), Sodium Bicarbonate, Citrus Bergamia (Bergamot)*, Citrus Reticulate (Tangerine)*, Citrus Aurantium (Neroli)*, Citrus Reticulate (Green Mandarin)*, Melaleuca Alternifolia (Tea Tree)*, Commiphora Myrrha (Myrrh)*, Lavandula Angustifolia (Lavender)*, Citrus Aurantium (Petitgrain)*, Cananga Odorata (Ylang Ylang)*. (Citral, Geraniol, Citronellol, Linalool, Limonene – Naturally Occurring Components Of Essential Oils). Amber Rose: Avena Sativa (Aqua & Oat Kernel)*, Decyl Glucoside , Sodium Cocoamphoacetate, Coco Glucoside, Aloe Barbadensis (Aloe Vera) Extract*, Glycerin (Vegetable), Glyceryl Stearate, Xanthan Gum, Argania Spinosa (Argan Oil)*, Rosa Canina (Rosehip Oil)*, Cocos Nucifera (Coconut Oil)*, Quillaja Saponaria (Soap Bark)*, Benzoin Oil*, Dehydroacetic Acid, Sorbus Aucuparia (Sorbic Acid), Sodium Bicarbonate, Pelargonium Graveolens Roseum (Geranium)*, Citrus Sinensis (Orange)*, Rosa Damascene (Rose)*, Anthemis Nobilis (Chamomile)*, Pogostemon Cablin (Patchouli)*, Cedrus Atlantica (Cedarwood)*, Citrus Aurantium (Neroli)*, Cananga Odorata (Ylang Ylang)*, Hippophae Rhamnoides (Sea Buckthorn)*, Carthamus Tinctorius (Safflower)*. (Linalool, Limonene – Naturally Occurring Components Of Essential Oils). Like this better than the shampoo! I bought the citrus scent in this hair cream to compare it to the shampoo I received in my monthly box. Not only do I prefer the citrus scent, but I feel that this hair cream gets my hair cleaner. It has a nice, creamy lather that feels great and is easy to spread throughout my hair. The only negative is that I have to use so much with each wash. This shampoo does not foam up like regular shampoo, so at first you keep thinking you're not using enough. But it's actually working, even without all the lather. You really don't need to use a lot, and sometimes I'm not even sure if I've got full coverage, yet, my hair feels great. And smells fantastic too (I bought Amber Rose). I'm using the 4-in-1 conditioner, and together they are working very well. My hair feels very soft after using this. I adore this hair cleanser! I purchased the travel size in Amber Rose and the smell is amazing. It leaves my hair + scalp feeling clean. I really feel it's making a difference in my overall scalp health (I don't have to wash as frequently). I'm looking forward to trying many of the other items from Tabitha. I'm super excited to try out the new shampoo and conditioner- can't wait! I bought this hair cleanser in amber rose . the smell is divine and I love how my hair looks after . now I want to buy a bigger size !!!!! !